A- Aadhere to and abide by the directives and standards Environment Program and Occupational Safety and Health. B- Stop their work and their personal temporarily and then seek advice from their superiors before resuming their work when they know the circumstances relating to the environment, safety and occupational health. C- Reporting any incident related to the environment, safety and occupational health to their superiors. This policy will be amendment annually if substantial amendments in the laws and regulations or in the face of the work place and these amendments will be in transition. 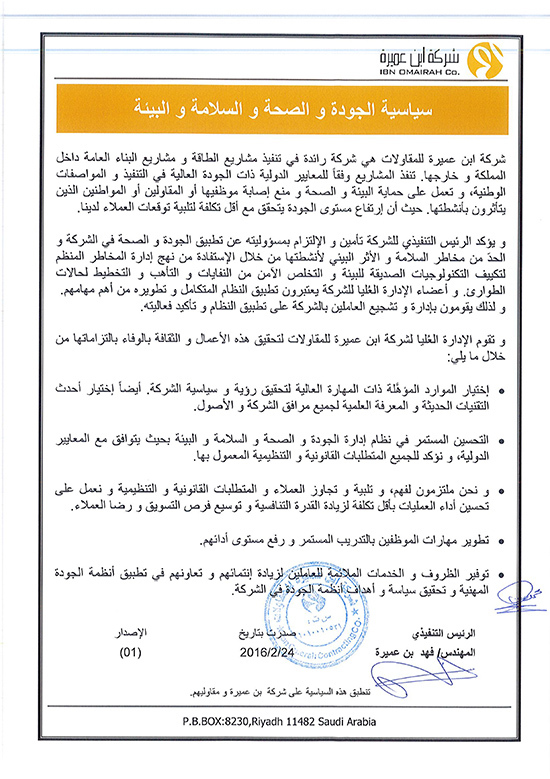 This policy is put in a prominent place in all offices IBN OMAIRAH temporary and permanent Inc. In places where advertisements exposed workers will be placed in the image of which the company’s website. As will be supplied to companies that deal with the manner of these policies IBN OMAIRAH.